We have supply issues with this pipe, but if the "Add to Cart" button is working that's a sure sign that we have them on hand. We are happy to announce and offer the new Jason Dagner designed "Sitting Poker", which is the first "Dagner Pipe Designs" Custom Corn Cob Pipe. And what makes this pipe so special? Let's begin with the size. It comes in at a small 4½ inch length, but features a large 2 inch tall bowl. This is roughly the same size bowl as that found on our popular "Kolonel" pipe. For a pipe with a small footprint, it has a tremendous capacity. The unfiltered hardwood shank features a gorgeous silver-tone band and the high-quality Italian acrylic stem is outstanding! Top all this off with the combined Dagner Pipe Design / Missouri Meerschaum logo imprinted on the hardwood plug in the bottom commemorating this collaboration. Obviously at $20+ for what is, after all just a corncob pipe, it may not be for you. But if you've always wanted a higher quality corncob pipe that is extra special, then this pipe is definitely something you will want to add to your collection! So the Dagner Cob really is a great pipe. It's compact, it's a sitter, it has a great chamber size, it looks great, and it's an all around badass pipe. However, due to the drilling on the bit itself, this pipe is prone to gurgling unless you either redrill the bit (which is pretty easy if you have the tools) or swap it out for a Danish bit. So... if you don't have the tools, just order a Danish bit of your choice color at the same time that you order this pipe. I love my MM cobs! Compared to some good briar I have they are the coolest, driest smokers for the money. And, with care they last. That said, I've purchased TWO Dagner Pokers, almost a year apart, and they both SMOKED WET. I had hoped that my first one was the odd exception. The second was no different. Aesthetically, this poker is such a beautiful, classic design. They were well constructed with good attention to fit, alignment and solid materials. Mine just didn't smoke well. I can't understand why the physics of this design produced such poor results. My other cobs are far superior smokers. I've discarded both Dagners in frustration. I have never had to run a pipe cleaner through any of my cobs while smoking them, let alone do so multiple times throughout the smoke. 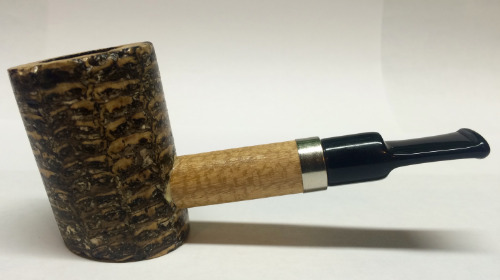 It wasn't the tobacco either, as the same baccy worked fine in my other cob models (Danish Egg, Country Gents, Freehand and Legends), I would have loved to give this model a better rating, but appearance isn't everything. Aristocob gets a 6 star rating as a company. Excellent service! I have never had it gurgle like one person said, but in all honesty, this is my least favorite pipe I own. Im a first time buyer at Aristocob and let me say that I wish all business in our country was conducted the way these people do it! They go far above and beyond to take care of their customers without even being ask. My pipes look perfect. I could not have hand picked them out of a box of a hundred any better myself. I will be back many times! Thanks!